If your Corian® countertop in Queen Creek has become damaged and unappealing to look at over time, trust the professionals at AZ Countertop Repair & Refinishing to repair your Corian® countertop with ease and quality in mind. Your countertop is often the centerpiece of your kitchen, so making sure it remains in the best condition possible is important to the experts at AZ Coutnertop. With over 30 years of experience and five star reviews on both Google, and Yelp, giving you the best Corian® countertop repair is our top priority. We also provide excellent sink replacement and installation, as well as countertop refinishing services for your convenience. Get your countertop in Queen Creek repaired by the professionals at AZ Countertop! Your choice of countertop has a big impact on the look of your kitchen and the value of your home. Durable countertops that have a beautiful look improve the profile of your kitchen and your home while also improving the experience in your kitchen by reducing your maintenance. Solid surface Corian® countertops are a top choice for kitchens in Queen Creek and throughout the country because they are economical, practical, and stylish. While Corian® countertops resist most common kitchen damages, they are not immune to problems. Carelessness or accidents in the kitchen can lead to cracks, chips and more serious damage. Instead of spending thousands of dollars to replace your countertops, you can call the repair experts at AZ Countertop Repair & Refinishing. Our experienced team can fix repairs of all types and have your countertops looking like new again. No job is too large or too small. We’ll evaluate your countertops and let you know what kind of repair is needed and give you a free estimate. If the damage is minor, we may recommend refinishing, which can achieve the same results. Corian® countertops are quite durable, but they can still obtain scratches with time and overuse. For the best countertop scratch repair services, come to AZ Countertop! When your Corian® countertop has sustained heavier damage, get the best Corian® countertop crack repair services from AZ Countertop, and your countertop will look brand new! When your sink has sustained damage and is becoming an eyesore in your home, get the best sink replacement and installation services by AZ Countertop! We are dedicated to exceeding our customers’ expectations with our superior workmanship. You won’t be able to locate the source of the previous damage. Your Corian® countertops will look flawless when we are finished. 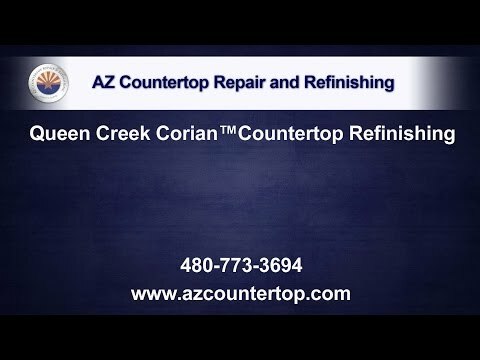 Call the experienced team at AZ Countertop Repair & Refinishing to learn how you can restore your Corian® countertops in Queen Creek. Our team has been in the business for three decades, and we have earned a reputation for providing some of the best service and results in Queen Creek and the surrounding area. Call us today to learn for yourself why we’ve earned that reputation and be amazed at the results we will achieve for you. Our experienced team can fix repairs of all types and have your Corian® countertops looking like new again!